The fishermen, boaters and student groups in New Haven Harbor formed the backdrop Tuesday morning as environmentalists and political leaders discussed a new study on the health of Long Island Sound. A man climbed high in the rigging of the Quinnipiak, a wooden, three-masted schooner docked at City Point Pier, while children at a waterfront summer camp played nearby. The 26-page Sound Vision report lays out the $6 billion in water quality improvements Long Island Sound needs, and includes a 10-year timetable to complete the work. "Stories like the fights over Broadwater and Islander East," energy projects that had been proposed for the Sound, "often don't have happy endings. But people dug in their heels and we need to do that again," she said. Members of the Long Island Sound Citizens Advisory Committee, which has members from New York and Connecticut, drafted the Sound Visions study. It calls for several measures, including a program that would allow people to return unused prescription medications to the pharmacy for disposal. Medicines flushed down the toilet eventually reach the Sound, said Rebecca Kaplan of the Connecticut Fund for the Environment. Curt Johnson, program director of the Connecticut Fund for the Environment and the committee's co-chairman, said that one in 10 Americans live within an hour's drive of Long Island Sound. "The largest bass in the world was caught last week in the Sound, about 15 miles from here," he said at the news conference. Environmentalists believe that the herring stocks that have increased since Bride Brook and other tidal streams were restored are leading to larger fish in the Sound, he said. But there was some bad news, too. After years of decreases, the number of beach closings because of poor water quality increased to 143 days during the summer of 2010, from 108 a year earlier, said Leah Schmalz, legal affairs director for Save the Sound. Water quality at 48 beaches along the Sound were sampled daily; the total reflects the number of days that swimming was prohibited in at least one of the beaches surveyed. 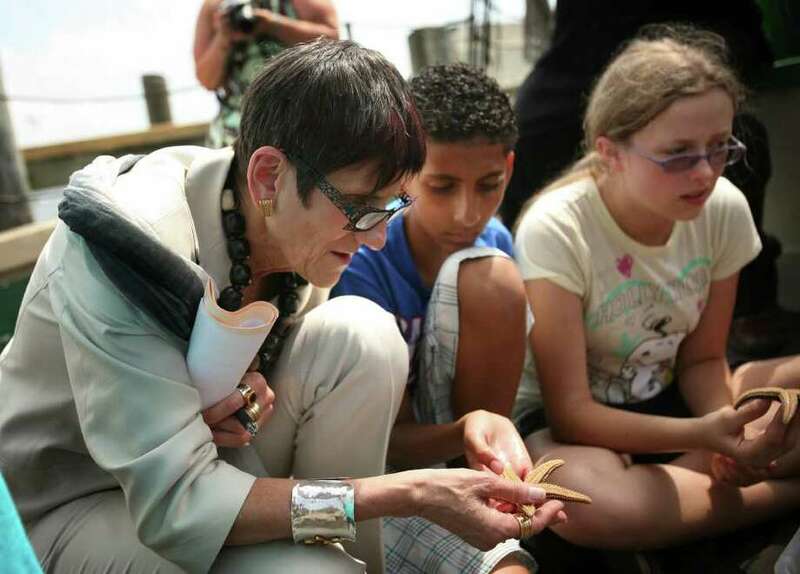 Tuesday's event was part of a summerlong "schooner tour" of Connecticut, Westchester County and Long Island that has already had officials talking about the plan in Mamaroneck and Port Jefferson, N.Y. It will travel to Bridgeport on Aug. 15, Old Saybrook on Aug. 24, Mystic on Aug. 27, Hempstead Harbor, N.Y., on Aug. 30 and Greenwich on Sept. 6.